On our left we have Steve Redzikowski from Boulder, Colorado by way of Long Island. On our other left is Kelly Liken of Vail, Colorado by way of Top Chef. Aww, isn’t that cute? Ilan let another girl into the kitchen, even after the last two spent the entire hour braiding each others’ hair and talking about which boys they like-liked. 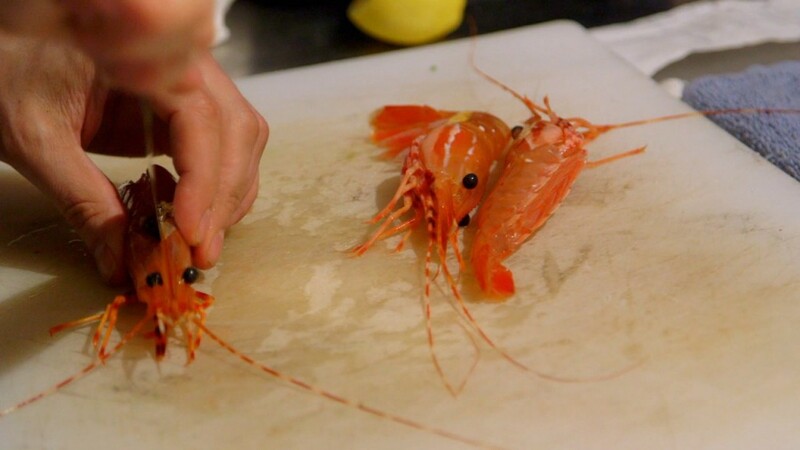 Spot prawns: These shrimpy shrimps still have some kick left in ’em! The chefs are both planning three dishes in one hour using all of the ingredients. Kelly’s first dish is beef heart tartare, and Steve’s first dish is beef heart carpaccio. So…they’re both serving raw beef heart. My gag reflex is twitching. Kelly’s second dish requires a bit of beef heart pressure cooking. Onions, garlic, what could possibly go wrong? Oh, just everything, and you’ll never know until it’s time to plate the dish. The first plate is out and it’s Steve’s beef heart carpaccio. No one threw up, so that’s good. It’s possibly over-garnished. Kelly, on the other hand, is planning on putting out all three dishes at once. It’s almost like she’s never seen the show before. Shrimp curry? Yes, please! Steve brought his own shrimp paste because who doesn’t carry around a packet or two of shrimp paste? Kelly is also making a broth, but it’s a soup instead of a curry so I automatically like it a lot less. And off with their little prawn heads! That’s brutal, lady! Steve uses the equally brutal knife-to-the-head technique, but my goodness these prawns are feisty. They’re still moving on the plate despite being split in two. He serves raw spot prawns with coconut curry sauce. “I’d love to have a bowl of these…except for the dandelion.” So a mixed review. Kelly is finally plating her first dish when she slices her thumb in a total rookie move. Medic! Meeeeedddddic!!! A Band-Aid and a glove and we’ve got beef heart tartare with dandelion greens. The judges seem pleased and ask for seconds. Her second dish is shrimp broth with beef heart and dandelion greens. She pretty much won the competition already, but let’s play this thing out to its end. Uh oh. The Fry-O-Matic is dead, along with Kelly’s entire third dish. So much for that pressure cooker. There’s only one winner, and it’s Kelly Liken. Good for her and her new chopping thing.